Since the end of the 80’s, the greater part of Pop Rock artists ended their bands or just changed their musical orientation. But it came back since the last decade, adopting new formats. And the Canadian sextet MYSTERY is a fine example of what I mean, for their new album, “Lies and Butterflies” is a collection of old influences with their personality and some interesting features. Their music is deep and introspective, bearing excellent keyboards orchestrations, in a way they fuse Pop Music, some Hard Rock bits and neo Progressive Rock influences as well. We could say that their music is heavily influence by the Progressive Rock aesthetics that MARILLION uses in some of their albums, besides the Canadians bear a proper personality on their songs. 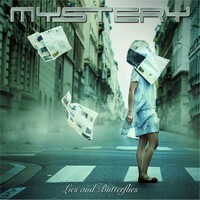 And to be honest, besides their work is not so easy to be swallowed by every music fan that exists, their musical work shown on “Lies and Butterflies” is really charming, melodic and can earn them some more new fans. Produced by the band’s guitarist Michel St-Père, everything sounds clear and tender, with a very good set of instrumental tunes (except for the distorted guitars that could be cleaner). It’s not a Metal album, so the sound clarity is the most important feature of all, and it’s near perfection. It’s in a point that we can understand and absorb their music without great efforts. Their seven songs are all very good, being their highlights “Come to Me” with its charming melodies and good technical work (especially on the guitars and vocals), the introspective and tender “How Do You Fell?” (that shows a charming work on keyboards and on the rhythmic session) and “Dare to Dream” (what a great work from vocals), and the hypnotizing contrasts presented on “Where Dreams Come Alive”. But they could work on shorter songs, because the length of “Looking for Something Else” and “Chrysalis” are greater than the needed. This album is a very good work from the sextet, indeed, but it’s not easy to be swallowed by a broader public. Record Label: Unicorn Digital Inc.